Something about jazz writing is like an obituary, a reflection on a life that's lived and regret for a life that's lost. Performances must be experienced. Recordings can be savored. But once they're done, they're done. One may reflect on it, yet no one can sustain or recreate the moment - certainly not in words. Just like a life. It's not for nothing that Miles Davis wanted to let the music speak for itself. Jazz is life. Talking about it may be like an obituary, but it helps us survivors to keep the music alive. If the sadness of death - and the irony of this particular writer's position - seems to haunt these words, it is because the world lost Frederick Dewayne Hubbard (April 7, 1938-December 29, 2008) shortly before the release of this exhilarating, too little-known recording of his. Even though he kept a low profile during the last 15 years of his life (due to a busted lip), Hubbard had become one of the greatest trumpet players jazz ever knew, able to swing easily and identifiably in bop, modal and free environs and successfully wed elements of soul, R&B and popular music into his work. Freddie Hubbard contributed significantly to jazz during a half century of performance as a solo artist, a side man and even as a session player. He was a gifted improviser and participated memorably in some of the art's best and best-known recordings. Sample John Coltrane (Olé Coltrane, Ascension), Eric Dolphy (Outward Bound, Out To Lunch), Ornette Coleman (Free Jazz), Oliver Nelson (The Blues And The Abstract Truth), Herbie Hancock (Takin' Off, Maiden Voyage, Empyrean Isles) and classic recordings by Art Blakey, Randy Weston, Quincy Jones, Wayne Shorter, Dexter Gordon and many others. Hubbard also recorded countless classics of his own during productive stays at Blue Note (1960-65), Atlantic (1966-70) and CTI (1970-73) and many that deserve significant reconsideration at Columbia (1974-1980). By the time of Rollin', Hubbard wasn't hitched to any one label, but he recorded and performed more frequently than ever before. He was also free to play pretty much whatever, whenever and wherever he wanted. 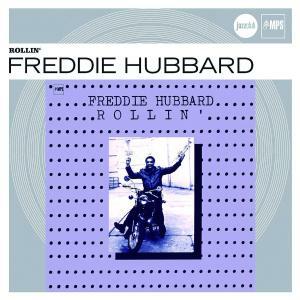 Originally recorded live in Germany's Black Forest at the Villingen Jazz Festival between Hubbard's American studio recordings Outpost (Enja) and Ride Like The Wind (Elektra Musician), Rollin' was the second of Hubbard's two MPS sets - 1969's The Hub of Hubbard was the first - and this one comes almost exactly at the mid-point of Hubbard's career. It was an awkward period in jazz and a somewhat mystifying time in the trumpeter's history. After a series of commercially unsuccessful - yet artistically redeeming - fusion albums the trumpeter made for Columbia (although the "straight ahead" VSOP albums Hubbard participated in are often forgotten in this period), there was a mistaken impression that Hubbard was searching to regain some sort of a foothold. Nothing could be further from the truth. Rollin' shows no such sign of indecision or uncertainty. This is a leader very much in control, playing with passion and grace and collaborating with what turned out to be one of his best and most well-documented bands. MPS allowed Freddie Hubbard to pretty much roll as he wanted here, with his own band doing his own tunes. By this point, Hubbard had built up a sizeable back catalog of music he could pick and choose from. Rollin' offers a bountiful selection of just some of the goodies from Hubbard's cupboard. The fiery "One Of Another Kind" was originally heard on a McCoy Tyner album featuring Freddie Hubbard, Together (1978), then on the VSOP album Live Under The Sky (1979). The song was, by this point, a staple of the trumpeter's performances, and also appeared on many subsequent albums. Hubbard's powerful delivery here calls one to stand up and take notice. It certainly roused this audience to rapt attention. "Here's That Rainy Day" was one of those classic torch songs made famous by Frank Sinatra in the late 1950s and first recorded by Hubbard on his album Straight Life (1970). Here, Hubbard moves over to the flugelhorn, for which he shows a particularly beautiful hand, wreaking the most melodic of moods out of the song's melancholy maisma. Bassist Larry Klein's "Cascais" first appeared on Hubbard's final Columbia album, Skagly (1979), featuring the same rhythm section heard here. Schnitter is on soprano and Childs switches to electric piano. Hubbard sounds positively inspired by Klein's slightly Latin textures and Klein himself delivers an outstanding solo on electric bass. Hubbard's spritely "Up Jumped Spring" first appeared on Art Blakey's Three Blind Mice (1962) and was later revived for Hubbard's Backlash (1966). The ever-lilting, light-as-air waltz is now something of a standard. Here Freddie floats effortlessly like a butterfly over the warm waves his group generates for him here. Hubbard debuted "Byrdlike" with a different spelling on Ready For Freddie (1961) and later revived the straight bop number with this spelling on the VSOP album The Quintet (1977). The song is said to be a tribute to fellow trumpeter Donald Byrd, but just one listen seems more accurately to reference Charlie "Bird" Parker. Maybe it's meant to immortalize both. Hubbard (on flugelhorn) and Klein (on upright bass) engage in a marvelous little pas de deux here, both soloing magnificently. It's clear that whatever winged thing Hubbard is referencing inspires him to take flight. "Brigitte," written for Freddie's wife and widow, first appeared on Hubbard's Keep Your Soul Together (1973) and was the highlight of such later albums as The Love Connection (1979) and Ride Like The Wind (1981). Here, the group (less Schnitter) offers a most moving tribute to the trumpeter's special lady, with the trumpeter providing some of his loveliest declarative statements. "Breaking Point," the title song to Hubbard's 1964 Blue Note album (showcasing his very first working group), didn't often feature in the trumpeter's performances. But here he revives this exciting number, bringing out its inherent calypso catchiness (indeed this rendition evolved into "Calypso Fred," heard on Hubbard's 1983 album, Sweet Return). Schnitter digs, appropriately, into his Sonny Rollins bag, inspiring both Hubbard and Childs, on electric piano, to deliver exceptional, crowd-pleasing solos. A fine exit indeed.